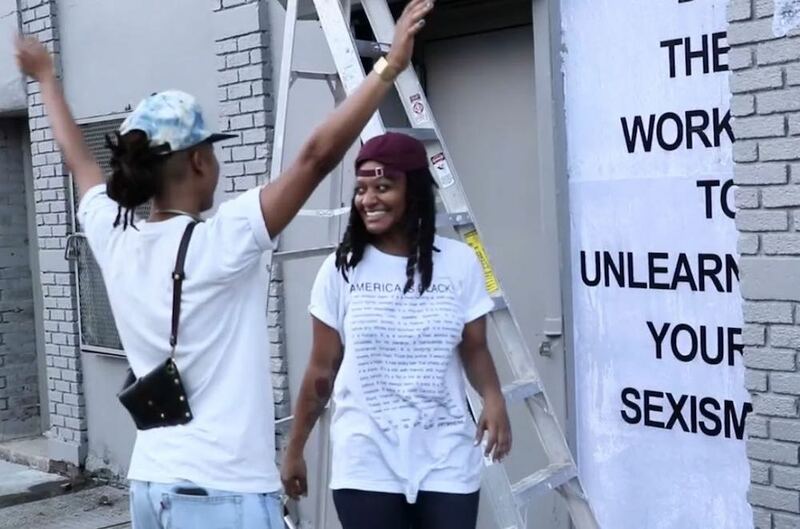 In “Inspiring Woman,” street artist Tatyana Fazlalizadeh focuses on fighting harassment. American Masters is launching its first web series, highlighting women who are “innovative powerhouses,” according to EP Michael Kantor. Inspiring Woman is a six-part series. Each episode, between five and seven minutes long, introduces viewers to women including artist Tatyana Fazlalizadeh, known for her “Stop Telling Women to Smile” anti-harassment work; Tracy Clayton, co-host of the BuzzFeed podcast Another Round; Sara Chipps, co-founder of the web and software development nonprofit Girl Develop It; and award-winning New York City restaurateur Angie Mar. Episodes post bi-weekly through Jan. 17. “Our digital platforms give us a chance to spotlight new voices in our culture,” Kantor said in the announcement of the series premiere Wednesday. The program is part of a year-long initiative, #InspiringWomanPBS, which launched in January. The project is based on values important to writer Maya Angelou. Using the hashtag, people can share stories of women who have inspired them. American Masters will present a monthly compilation of the best submissions. The documentarian died Sept. 16 at the age of 97.